Gingerbread Oatmeal Homemade Breakfast Bars (V, GF): an easy recipe for soft, homemade breakfast bars filled with your favorite holiday flavors. Vegan, Gluten-Free, Dairy-Free. In a large bowl, whisk together all of the wet ingredients: flax eggs, coconut oil, almond butter, coconut sugar and molasses. Whisk until smooth. Add dry ingredients: oats, flour, spices, baking powder, baking soda and salt. Whisk until it becomes difficult to stir. Switch to using a rubber spatula, folding until well combined. Fold in cranberries, pecans and walnuts. Pour into the prepared baking pan. Using the rubber spatula, spread into an even layer. Optionally, press cranberries and pecans onto the top of the bars. Bake for 22-28 minutes. Mine took 25 minutes. You’ll know it’s done when the edges turn a dark, golden brown. Place on a cooling rack for 1 hour, or until completely cool. Slice into 16 bars. Enjoy! 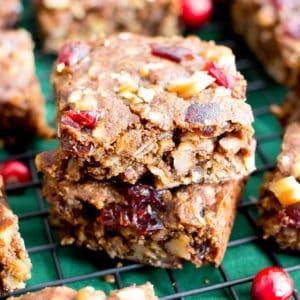 - Adapted from my Cranberry Almond Butter Breakfast Bars and my Pumpkin Chocolate Chip Breakfast Bars. - Store in an airtight container for up to 1 week. - More Breakfast Treats: Good Morning Breakfast Cookies, Maple Pecan Pumpkin Muffins, Peanut Butter Banana Breakfast Bars.